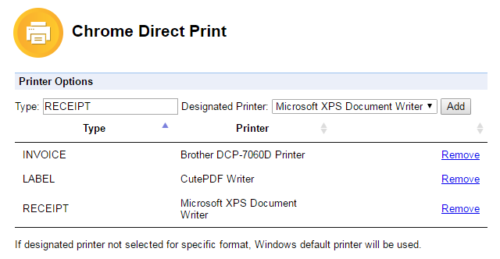 On cash sales we print the on the thermal receipt printer (Via posbox which we do not want – we want to connect the thermal printer direct to the windows machine) and on account sales we print 2 copies on the laser printer by downloading a pdf in chrome viewer – we want this to print automatically without the dialog box. I tried to use your Silent print extension for Chrome but was anable to get it to work. However I have abandoned this project because of technical limitations on Chrome extension. which is also open sourced and have better compatibility, performance and functionality. “WebApp Hardware Bridge” support base64 encoded PDF file. How about open sourcing this? The setup is pretty basic but very powerful! I’d love to contribute to enhance this. I could use it for a project, but some extra features would be very handy! I try “WebApp Hardware Bridge” , it work well in Intellij , But when i Create the setup and install it , the link in the desktop does’nt work , the message is ” Could not find or load main class tigerworkshop.webapphardwarebridge.Server.